Just a few days ago, Hurricane Michael was forecast to strike the Florida Panhandle as a relatively weak hurricane—a dangerous storm, to be sure, but nothing especially historic. Instead, Michael will be remembered as one of the most damaging and powerful storms ever to wallop the continental United States. After coming ashore Wednesday afternoon as a powerful Category 4 hurricane, Michael slashed a path of near-total destruction across the Florida Panhandle and into southeastern Georgia. The storm’s freakishly low pressure and sustained, brutally strong winds—which peaked at 155 miles per hour—flattened neighborhoods, snapped trees in half, and left hundreds of thousands without power. At least six people lost their lives to the storm, according to officials. Scenes of near-cataclysm are trickling out from across Florida’s Gulf Coast. In the beachfront town of Mexico Beach, Florida, roads now provide the only interruption to piles of rubble that used to be city blocks. At Tyndall Air Force Base, also on the shore, the storm tore the roofs off military hangars and then pushed around the heavy warplanes resting inside as if they were children’s toys. Even inland, the winds—which blew as fast as those inside a tornado—collapsed churches and gas stations, knocked 18-wheelers on their sides, and stripped dense woodland entirely of its greenery, leaving behind only clusters of huddled, naked trunks. “Students in tropical-meteorology classes are going to be talking about this storm for 20 years,” says Colin Zarzycki, a tropical-cyclone scientist at the National Center for Atmospheric Research. 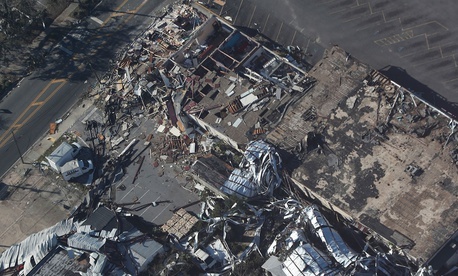 In fact, Hurricane Michael’s landfalling barometric pressure of 919 millibars was lower than Andrew’s reading of 922 millibars, making Michael the third-strongest U.S. hurricane on record as ranked by pressure. Michael is also the strongest hurricane ever to make landfall this late in the season. This staggering intensity let Michael break other records. It remained an intact, fast-moving hurricane many hours after coming ashore. When its eye crossed the Florida-Georgia state line just after 6 p.m., it still unleashed Category 3 winds of 120 miles per hour, and it became the strongest hurricane to strike Georgia directly in a dozen decades. A number of factors let Michael stay so strong even as it penetrated more than 50 miles inland, Zarzycki told me. “The area where Michael made landfall, over the Florida Panhandle, tends to be a swampy, smooth region. It’s fairly moist, fairly flat, and it doesn’t disrupt the storm core,” he said. Michael was also moving fast—much faster, for instance, than Hurricane Florence, which dawdled over the Carolina coast for days—so “even though it was decaying rapidly, it could get pretty far,” he added. It also benefited from even, high-atmospheric winds that let the storm continue to pull energy into its core and up through its eye. “It takes considerable time for the hurricane to expel its energy as it interacts with land,” said Dennis Feltgen, a meteorologist with the National Hurricane Center, in an email. Zarzycki agreed that Michael’s long-term survival as a tropical system was not the storm’s most notable trait. Instead, meteorologists will recall its shockingly fast intensification, he said. Starting around midday Tuesday and continuing until the moment of landfall, the storm grew in intensity, ballooning from a Category 2 storm into a near-Category 5. Not until 5 a.m. Eastern time on Wednesday did Hurricane Michael start to look like a potentially catastrophic, Category 4 storm on satellite imagery. “That’s when it had a clearly defined eye, and when it presented as a textbook tropical cyclone,” Zarzycki said. That surprising rapid intensification, right up until the moment of landfall, is what made the storm so catastrophic. “If you had offset that intensification in 24 hours in either direction, Hurricane Michael wouldn’t have had the landfall impact that it did,” Zarzycki told me. And it points to an ongoing challenge for hurricane forecasters and researchers. Over the past three decades, the National Hurricane Center has gotten substantially better at predicting hurricane tracks—and, indeed, as early as Saturday, its meteorologists correctly foretold that Michael would make landfall in the Florida Panhandle midweek. But they have not made nearly the same amount of headway forecasting hurricane strength, and that hasn’t improved since 1990. Even on Monday, “the best guess as a forecast was that [Michael] would probably strengthen into a hurricane—but we’re talking Cat 1 winds of 85 miles per hour, let’s say,” Zarzycki said. Forecasting hurricane strength is one of the biggest challenges that hurricane scientists face—especially because climate change is likely to make rapid intensification a far more common occurrence. Otherwise, there will be more tropical cyclones as shocking as Michael, a storm that seemed modest, unremarkable, and almost innocuous—until suddenly it wasn’t.